The United States currently imposes the highest statutory corporate tax rate in the developed world. Contrary to what some believe, studies show that even the effective corporate tax rate in the United States is one of the highest in the world. 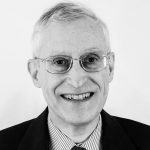 In a literature review of thirteen credible, independent studies that estimated effective tax rates using a variety of data sources and methods, Philip Dittmer reported that every study found the U.S. effective corporate tax rate to be substantially higher than the average in foreign nations. Across all thirteen studies, the U.S. effective corporate tax rate exceeded the foreign average by 7.6 percentage points, if all countries are counted equally. The U.S. effective corporate tax rate exceeded the foreign average by 3.7 percentage points, if countries are weighted by their gross domestic products (GDP). Many policymakers and economists believe the steep rate discourages U.S. companies from investing as much as they would otherwise and reduces their competitiveness in international markets. For instance, a study from the Organisation for Economic Co-operation and Development (OECD) that compared corporate income taxes, personal income taxes, and consumption taxes concluded, "Corporate taxes are found to be most harmful for growth." A major barrier to cutting the U.S. corporate tax rate, however, is the reported revenue cost. According to conventional revenue analyses, such as those performed by Congress's Joint Committee on Taxation (JCT), a lower corporate tax rate would be an expensive revenue loser and would deepen the government's already worryingly large budget deficit. If these estimates are correct, they suggest a difficult trade-off: the United States' record-holding corporate tax rate hurts but so would cutting it. In reality, the trade-off posited by conventional revenue estimates is misleading. The estimates overstate the revenue cost of cutting the corporate rate and overstate the potential revenue gains from increasing it, because they ignore tax-induced growth effects. Most notably, Congress's JCT has adopted the static assumption that tax changes have absolutely no impact, for good or ill, on total production, employment, investment, consumption, and other macroeconomic aggregates. The JCT's modeling does permit tax changes to alter the composition of aggregates, for instance, more of one type of investment and less of another or a shift of employment from one sector of the economy to another, but rearranging the pieces without letting the totals vary still assumes away growth. The static assumption has the advantage of simplicity, and it is not too far from the truth for tax changes that either have little impact on incentives at the margin or affect parameters that do not respond much to incentives. This is an extremely unrealistic assumption, however, in the case of the corporate income tax rate. Changes in that rate do alter rewards at the margin and investors respond strongly to incentives. In other words, when the full economic effects of cutting the corporate income tax rate are taken into account, the federal treasury would collect more in total revenue than it would lose from the lower rate. This paper uses the Tax Foundation's dynamic simulation model to provide revenue estimates that incorporate tax-related growth effects. A key finding is that a lower corporate tax rate would strengthen the economy and simultaneously improve the federal budget. The Tax Foundation's dynamic simulation model provides quantitative estimates of the growth and revenue effects. The model estimates, for example, that cutting the federal corporate tax rate from 35 percent to 25 percent would raise GDP by 2.2 percent, increase the private-business capital stock by 6.2 percent, boost wages and hours of work by 1.9 percent and 0.3 percent, respectively, and increase total federal revenues by 0.8 percent. The model has two main components. One is a production function based on neoclassical economics and on empirical relationships observed since World War II. This part of the model estimates the changes in labor and capital inputs that occur in response to tax changes and, in turn, how the new quantities of labor and capital affect output and incomes. Underlying the production function is a recognition that the amounts of labor and capital that people desire to supply depend on incentives and that taxes can alter those incentives. The second major component of the simulation model is an individual income tax calculator. Using a large representative sample of individual income tax returns from the Internal Revenue Service (IRS), the tax calculator estimates the impact of changes in tax provisions and economic activity on individual income tax collections. The Tax Foundation model also includes equations to estimate government receipts from a variety of other taxes and fees based on tax parameters and the size and composition of the economy. The model takes account of interactions among its components and reaches a solution through several rounds of iteration. The model does not predict the year-by-year path of tax revenues. It instead estimates the revenue change that will occur after people have fully adjusted to the new tax rules. (This is known as a comparative statics model.) While the adjustment process is not instantaneous, it does not take that many years. With capital, experience indicates that most of the adjustment will have been completed after five years for equipment and after ten years for structures. To illustrate how the Tax Foundation's simulation model operates, suppose the federal government increases the corporate income tax rate. First, under the unrealistic static assumption that the higher marginal tax rate has no impact on economic activity (that is, holding macroeconomic aggregates constant), the model calculates the increase in corporate tax collections as equal to the static tax base times the rate hike. Second, under the more realistic assumption that taxes can sometimes alter the size of the economy, the production function part of the model estimates the positive, or in this case negative, growth effects: the smaller after-tax reward for corporate investment (due to the higher tax rate) depresses capital formation; the diminished capital stock lowers worker productivity, thereby decreasing real wages and discouraging people from supplying as much labor as before; and the smaller quantities of capital and labor result in fewer goods and services being produced and less income being generated. Taking account of the drop in output and incomes, the individual income tax calculator estimates the reduction in federal individual income tax receipts, and other equations in the model estimate the smaller amounts collected by a variety of other federal taxes and fees. A limitation of the model is that it does not yet estimate the revenue consequences of the many behavioral changes that affect tax liabilities without altering the economy's real size, such as income shifting across borders or across time. Some important responses outside the model in the case of the corporate income tax are that alert business owners and managers may use transfer pricing, decisions about where to locate facilities, changes in where they borrow, and other techniques to recognize more income in low-tax countries and less in high-tax countries. Such actions work to the benefit of government treasuries in low-tax jurisdictions and to the disadvantage of treasuries in high-tax states. Businesses may also respond to tax changes by adjusting the timing of when they realize income, recognizing income at a slower rate when taxes are high than when they are low. Additionally, business owners react to the corporate tax rate when choosing their form of business organization; a high corporate tax rate will persuade more to organize as pass through entities. Although governments, especially those with steep taxes, often dislike tax planning, it is extremely difficult to prevent. Moreover, as Judge Learned Hand stated in a famous legal dictum, "Any one may so arrange his affairs that his taxes shall be as low as possible; he is not bound to choose that pattern which will best pay the Treasury; there is not even a patriotic duty to increase one’s taxes." The best government defense against vigorous tax planning is to keep taxes low. Because the corporate income tax rate impacts after-tax returns at the margin and investors are highly responsive to incentives, it is certain that dynamic revenue estimates for variations in the corporate rate will differ from static estimates. The next section of this study describes just how different they are. Moreover, because the model does not include some important revenue feedbacks, its estimates, although dramatic, are almost certainly too cautious. To measure the effects of different corporate tax rates on economic activity, we simulated the consequences of varying the federal corporate rate from zero to 60 percent. The federal corporate tax rate is currently 35 percent on most corporate income. In addition to the federal rate examined in this study, many states impose their own corporate income taxes. The Organisation for Economic Co-operation and Development (OECD) calculated that the combined (federal and local) statutory corporate income tax rate was 39.1 percent in 2012—the highest among the world's developed nations. The model was run under two sets of assumptions about the overall economy. One is the assumption often made by revenue estimators that tax changes do not grow or shrink the economy. The other is the dynamic assumption that if tax initiatives alter incentives, the new incentives will lead to changes in the quantities of labor and capital, causing the economy to expand or contract and having feedback effects on tax revenues. We first examined the effects of rate changes on corporate income tax collections alone, without considering economic feedbacks on other federal taxes. Chart 1 shows that if one assumes away growth effects, the relation between corporate income tax collections and the corporate tax rate would be linear, with a higher corporate rate collecting more money for the federal government and a lower rate bringing in less. At the extremes, it looks as though a corporate tax rate of zero would slash corporate tax collections by almost $200 billion while a rate of 60 percent would boost corporate tax collections by $140 billion. Based on the static assumption, in short, there seems to be a sharp trade-off between lowering the federal corporate tax rate and preventing the federal budget deficit from rising. To stay revenue neutral when growth effects are ignored, it appears that a decrease in the corporate tax rate would need to be accompanied by tax increases elsewhere or by cuts in federal spending. The model was then rerun taking account of incentives and growth effects. Surprisingly, the dynamic revenue estimates for corporate income tax collections were only slightly different from the static estimates. This outcome was unexpected because the model shows that a reduced corporate income tax would have powerful, pro-growth effects: a large jump in private businesses' capital stocks, a substantial rise in employment and labor compensation, and a healthy gain in GDP. The absence of a Laffer curve for the corporate income tax is also at odds with a number of empirical studies that have tracked the relation between corporate income tax rates and corporate tax collections in many foreign countries. As will be seen later in a review of numerous academic studies of the international experience, the revenue-maximizing corporate tax rate in many other countries is much lower than the current U.S. corporate tax rate. A closer look at the model explained what was happening. Part of the negative result is due to the modeling limitation described above: the model does not incorporate the many behavioral responses that alter tax liabilities without changing the size of the economy. The rest of the explanation is that when corporations expand in response to lower corporate tax rates, they invest more, which pushes up their depreciation allowances, and they hire more workers and pay higher wages, which boosts their labor expenses. The added capital and labor inputs lead to higher corporate productivity and output, but they also increase corporate expenses, with the result that pre-tax corporate income, on which tax is assessed, is quite similar in the static and dynamic cases. The dynamic simulation model finds that the corporate income tax rate has major impacts on the capital stock, work hours and wages, and GDP. The next several charts display the findings. 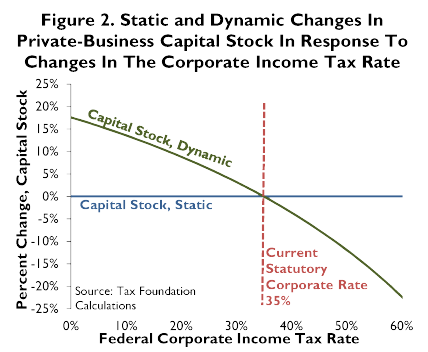 Chart 2 provides estimates of changes in the private-business capital stock, both as assumed in a conventional revenue scoring model and as estimated in the Tax Foundation's dynamic simulation model. The conventional model assumes that the total capital stock remains constant, regardless of the corporate tax rate (or any other tax rate), although some reallocation of capital among businesses may be allowed. This is shown in Chart 2 by the flat line that always registers zero change, no matter how high the corporate tax rate climbs or how low it falls. The simulation model's dynamic estimates are strikingly different. Because the desired capital stock is extremely sensitive to expected after-tax returns, a cut in the corporate income tax rate unleashes an upswing in investment that greatly expands private business stocks over a several year adjustment period. Analogously, a higher corporate tax discourages investment and leads to a significantly smaller capital stock than otherwise. The dynamic model estimates, for example, that a corporate tax rate of 25 percent would grow the private-business capital stock by 6.2 percent, while a 45 percent corporate tax rate would shrink business stocks by 7.5 percent. 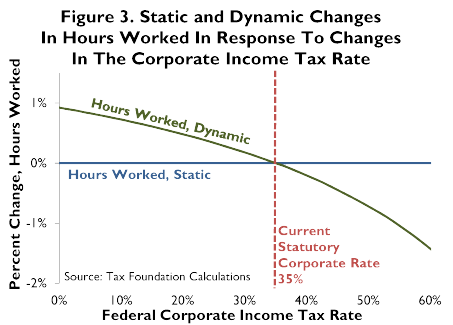 Chart 3 presents estimates of changes in hours worked in response to lower and higher corporate income tax rates. In the static model, the changes are zero at all tax rates because of the assumption that macroeconomic totals, including total work hours and labor income, do not respond to taxes, although there may be some shifts among the economy's sectors. This is shown by the flat line that always equals zero. In contrast, the dynamic estimates recognize that if the corporate tax rate falls, businesses will expand and seek more labor. Conversely, companies will cut back on labor if the corporate tax rate rises. Because the simulation model is calibrated to historic evidence indicating that the supply of labor is much less elastic than that of capital, variations in work hours are not as nearly great as those in the stock of capital. Still, they are substantial. For instance, according to the model's dynamic simulations, hours worked would grow by 0.3 percent if the corporate income tax rate fell to 25 percent (about 390,000 more full-time equivalent jobs in terms of 2012 employment) and contract by 0.4 percent if the corporate rate rose to 45 percent (about 510,000 fewer full-time equivalent jobs in terms of 2012 employment). It is not shown on the chart, but the model also estimates there would be a second benefit to workers from a reduced corporate tax rate: higher compensation. The reason is that as businesses expand in response to a lower corporate rate, they will want more workers, which will require them to pay more, and the influx of new capital will lift worker productivity, which will justify higher wages and benefits. The model estimates that average worker compensation would rise 1.9 percent if the corporate tax rate dropped to 25 percent but fall 2.4 percent if the corporate rate were hiked to 45 percent. In other words, workers would gain from a lower corporate income tax rate because jobs would become more plentiful and pay would get better. Chart 4 portrays changes in the economy's output of goods and services, GDP, as estimated in a conventional revenue scoring model that assumes tax changes have no influence on the size of the economic pie and in a model that allows for growth effects. The flat line—no alteration in GDP regardless of whether the tax rate is zero, 60 percent, or anywhere in between—depicts the static assumption. The line that rises as the corporate income tax rate falls presents estimates from the Tax Foundation model of the relationship between the tax's rate and GDP. For example, a 25 percent corporate tax rate would lift long-run GDP by 2.2 percent while a 45 percent rate would depress long-run GDP by 2.8 percent. The strong GDP response to changes in the corporate income tax rate is due primarily to the large swing in capital formation. The change in the labor force reinforces the effect. The basic idea is that a greater quantity of production inputs allows an economy to generate more output and support higher incomes, while a diminished quantity of inputs has the opposite effect. We next look at what happens to total federal revenue. Federal receipts include many taxes, fees, and payments other than the corporate income tax, such as the personal income tax, payroll taxes, and excises. The size of the economy strongly influences the amounts these taxes, fees, and other payments collect. This is relevant because of the corporate income tax's big GDP effects. A wide range of federal receipts will expand when a lower corporate income tax rate grows the economy but shrink when a higher corporate income tax downsizes the economic pie. 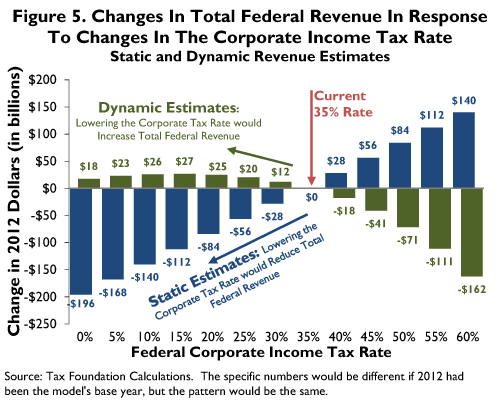 Chart 5 shows the impact of higher and lower corporate income tax rates on total federal revenues. The static and dynamic cases are mirror opposites. The static estimates, of course, include no growth effects because they rely on the assumption common in conventional revenue scoring models that taxes do not alter macroeconomic totals. The dynamic estimates reveal how different the results become when one takes account of incentives and growth effects. Whereas the static estimate claims a higher corporate tax rate would be good for the federal budget, a dynamic analysis indicates a higher rate would actually reduce total federal receipts and widen the budget deficit. For example, the model estimates that a 45 percent corporate rate would diminish total federal revenues by $41 billion. Conversely, because of the positive growth feedback, a substantial lowering of the corporate rate would improve total federal revenue collections. For instance, a 25 percent corporate rate would raise total federal revenues by an estimated $20 billion. The model calculates that the revenue maximizing tax rate would be 14 percent. At that rate, total federal revenues would actually increase by $27 billion compared to current law. The gain in federal revenues would be slightly smaller at lower corporate rates. Is the revenue maximizing tax rate also the optimal tax rate? Looking back at Chart 4, notice that GDP continues climbing as the corporate rate drops, with GDP reaching a maximum at a corporate tax rate of zero. Although a corporate rate of 14 percent would maximize federal receipts, counting all types of federal revenue, it would not be the optimal rate for the economy unless very little value is placed on people's incomes and the quantities of goods and services they can consume or invest. The model estimates that while cutting the corporate rate from the revenue-maximizing rate of 14 percent to zero would cost $9 billion of federal revenue, GDP would rise by roughly $300 billion, a payoff of about 33 to 1. The numbers suggest that the best corporate tax rate would be zero, unless every dollar flowing to the federal government is orders of magnitude more valuable than dollars retained by households and businesses. In addition to the economic feedback on government revenues, tax changes that hasten or slow growth will also affect federal spending. One spending-related feedback is that if tax provisions strengthen (weaken) the economy, wages throughout the economy will rise (fall), including those of government workers. The model provides an estimate of this spending feedback. For example, if the corporate tax rate were cut from 14 percent to zero percent, the model estimates that the healthier economy would push up federal wages by about $7 billion, causing the budget cost of the tax reduction to rise to about $16 billion (compared to the estimated revenue cost of about $9 billion). Even so, gaining $300 billion of GDP at a deficit cost of $16 billion (a benefit-cost ratio of nearly 19 to 1) still looks like a compelling trade. There is also a second, probably much larger, spending-related feedback. When the economy strengthens (weakens), the government spends much less (more) on a wide range of means-tested assistance programs. The model does not presently include this second type of spending feedback. If it did, it would likely indicate that a zero percent corporate tax rate would actually reduce the federal budget deficit. In the model, changes in the corporate income tax rate affect individual incomes because a lower (higher) tax rate causes the economy to expand (contract). Suppose, for instance, that Congress and the president decide to reduce the corporate income tax rate to 25 percent. This would decrease the cost of capital (sometimes known as the service price of capital), and business owners and managers would respond by substantially increasing their capital acquisitions over the course of several years. As the capital stock rose, workers would become more productive because they would have more capital tools with which to work, and their pay and hours would rise due to their higher productivity. Based on historic parameters, about two-thirds of the resulting gains in output and incomes would flow to labor and about one-third to capital. The model estimates that individual tax filers at all income levels (rich, middle class, and working poor) would enjoy roughly similar increases in their after-tax incomes. As shown in Table 1, the estimated after-tax income boost would be 2.01 percent for individual filers with AGIs in the $0-$5,000 range, 1.94 percent for individual filers in the $50,000-$75,000 range, and 1.99 percent for individual filers with AGIs in the $500,000-$1,000,000 range. The estimated average gain across all AGI classes would be 1.97 percent. The model estimates that a higher corporate tax rate would have analogous effects on individuals at all income levels, except the result would be across-the-board drops in after-tax incomes due to slower growth. The charts and discussion have, up till now, not said anything about state and local finances. As one might guess, a larger economy would be good for state and local revenues and a smaller economy would be bad. The model estimates, for example, that raising the federal corporate tax rate by 10 percentage points to 45 percent would reduce state and local revenues by 2.9 percent as a consequence of the smaller economic pie, while cutting the federal corporate tax rate by 10 percentage points to 25 percent would raise state and local receipts by 2.3 percent due to the stronger, larger economy. The federal government provides extensive monetary assistance to states and localities: federal grants-in-aid to state and local governments were almost 20 percent of total federal spending in 2011 (latest available data). A reduction in the federal corporate tax rate would be a win-win form of intergovernmental assistance: through action on this front, the federal government could substantially lift state and local revenues due to an improved economy at no net cost to the U.S. Treasury. A further benefit to states and localities is that the stronger economy would cut their spending on entitlement programs. If state and local budget positions improve as a result of the stronger economy, there might be an opportunity for the federal government to scale back some of its cash grants to states and localities. Most tax cuts do not pay for themselves. However, if a tax reduction improves work and saving incentives, it will generate positive economic feedbacks that offset some of the apparent revenue loss. The federal corporate income tax is unusual because the feedbacks there are so strong that cutting the tax's rate would, over a broad range, more than pay for itself in terms of federal revenues, with the bonus of lifting the incomes and productivity of people throughout the economy. 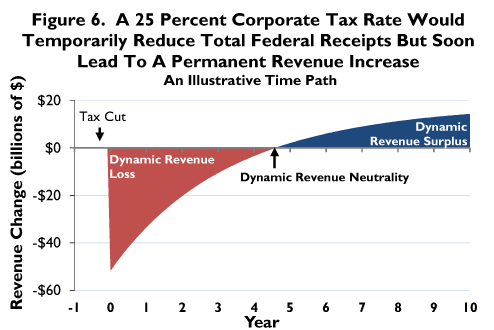 Nevertheless, a corporate rate cut would reduce federal revenues during a transition period, because the rate cut would begin immediately, while it would take several years for the capital stock to expand sufficiently in response to the new incentives to generate the growth needed to return revenues to their prior level. Chart 6 illustrates a plausible time path for the change in total federal revenues following a reduction in the corporate income tax from 35 percent to 25 percent. The immediate effect is that revenues fall. Temporarily, the results look like those of a conventional, taxes-don't-affect-growth revenue estimate. Very quickly, however, the revenue loss narrows precisely because a lower corporate income tax rate stimulates growth and the larger economy brings forth increases in a wide range of federal taxes, fees, and other collections. Because the simulation model does not predicts the time path for reaching the new equilibrium, the chart is an approximation derived by assuming that the time needed to place new capital in service is the chief constraint on the speed of the economy's adjustment, that most of the desired change in the stock of equipment will be completed within five years, and that most of the desired change in the stock of structures will be completed within ten years. Notice in the chart that the temporary revenue loss rapidly narrows and is soon replaced by a permanent gain in total federal revenues. A hike in the corporate income tax rate would produce the mirror image of this pattern: a transitory federal revenue gain followed by a permanent revenue loss. Policymakers should be provided with revenue estimates that inform them of the permanent benefits, but, given how enormous the federal deficit is already, they may wish to take steps so that the federal deficit does not increase, even temporarily, during the transition. On the spending side, with federal outlays having grown 22 percent in inflation-adjusted dollars from 2007 to 2011, surely there are some low-value government programs that could be trimmed. In the context of corporate tax reform, an appealing place to look would be corporate welfare programs that bestow valuable favors on particular companies or business activities in the absence of compelling equity or economic justifications. The Cato Institute has identified a long list of possible "corporate welfare" expenditures in the federal budget, totaling $97 billion dollars in 2012 budget outlays alone (more than ten times that amount over the ten year budget window). On the tax side, policymakers may wish to consider provisions that have large revenue costs while doing little to increase work and saving. With almost half of the population no longer paying the federal income tax, it may be past time to reevaluate the growing number and magnitude of individual tax credits. Looking at businesses, it would be reasonable to identify and weed out unjustified business tax breaks. With regard to business tax breaks, though, a danger is pointing to a provision that is needed to measure income correctly, incorrectly asserting it is a loophole, and demanding that it be eliminated. At one time, many egregious business tax loopholes did exist, but several tax bills in the 1980s, culminating in the Tax Reform Act of 1986, removed most of them. These days, most so-called loopholes turn out to be provisions that help measure income more accurately. Eliminating them would exaggerate true income and worsen tax biases against saving and investment. Many of the provisions are complicated, but that usually reflects the inherent complexity of income taxation and the way Congress has designed the tax code, not a lack of justification for the provisions themselves. For illustration, it is sometimes thought that current cost recovery schedules let capital investments be written off too quickly and that write offs should be slowed down radically. However, a solid economic argument can be made that the tax code should allow capital assets to be written off when the costs are incurred (expensing). By that standard, current cost recovery schedules are already too slow because they often delay write offs until years after assets have been purchased. It is sometimes suggested that a move to the ADS or a similarly sluggish capital cost recovery schedule would allow the corporate rate to be cut to 25 percent while maintaining revenue neutrality on a static basis, but the numbers for that do not work. Other tax increases would have to be added to the package in order to reduce the corporate rate to 25 percent while staying revenue neutral according to static scoring. The exact results would depend on which additional revenue raisers are chosen, but the dynamic consequences would probably be at least as bad as those modeled above, given that most of the auxiliary revenue raisers being discussed in Washington are biased against saving and investment. This paper employs a neoclassical, general equilibrium economic model combined with a tax calculator to simulate the effects of varying the corporate income tax rate in the United States. Several other studies have taken a different approach: determining the impact of the corporate income tax rate on corporate income tax collections by examining empirical evidence across many countries. The corporate tax data in the international studies reflect all the forces that cause corporate income tax revenues to respond to tax rate changes. A limitation of the international studies is that they do not explicitly model which feedbacks they are picking up, although it is generally agreed that changes in tax avoidance (legal) and evasion (illegal) are extremely important. Also, the studies do not capture the feedbacks that corporate rate changes have on other types of government revenues. The Tax Foundation model, on the other hand, carefully examines how changes in the corporate tax rate affect growth, and it estimates growth-related feedbacks on both corporate income tax collections and other government revenue sources. A limitation of the model is that it does not yet include other feedback channels. While the Tax Foundation model and the international studies take very different approaches, their findings are complimentary and mutually reinforcing. Both indicate that cutting the corporate income tax would be beneficial and that static revenue estimates are extraordinarily misleading. If anything, the empirical studies examining international evidence suggest that the positive revenue response to a lower corporate income tax rate would be stronger than that reported here. The likely explanation is that the Tax Foundation model takes growth effects into account, but not tax planning, while the actual tax-collection numbers in the international studies reflect both growth and tax-planning effects. Just as a balloon bulges out in one direction when you squeeze it from another, high-tax nations find it almost impossible to prevent a significant leakage of reported taxable income, no matter how onerous their rules intended to prevent it, while low-tax nations enjoy an inflow of taxable income, provided they respect the rule of law and offer economic freedom. In an econometric analysis of twenty-nine OECD countries over the period 1979-2002, Clausing concluded, "Overall, the data suggest that the revenue maximizing corporate income tax rate for the sample as a whole is 33%." Although this might seem at first glance like a weaker result than the 14 percent revenue maximizing rate discussed earlier, it is not because Clausing was only looking at corporate income tax revenues. The growth-led rise in other tax collections, which accounts for most of the gain in the Tax Foundation model, is a bonus on top of that. In another study, Devereux analyzed corporate tax data for twenty OECD countries from 1965 to 2004. To Devereux's surprise, the data indicated the "revenue-maximizing tax rate is likely to be low." Trying a variety of estimation specifications, his lowest estimate of the revenue-maximizing corporate income tax rate was 18 percent and the highest was 37 percent. Brill and Hassett extended Clausing's work by examining twenty-nine OECD nations over the period 1980-2005, again comparing corporate income tax rates and corporate income tax revenues. Brill and Hassett estimated that "the revenue maximizing corporate tax rate was about 34 percent in the late 1980s, and that this rate has declined steadily to about 26 percent for the most recent period." In other words, even before considering pro-growth feedbacks on other taxes, they estimated that the revenue maximizing corporate rate lies about 13 percentage points below the current combined corporate income tax rate in the United States. In a later paper, Hassett and Mathur commented that if corporate tax revenues rise with the tax rate "one might expect the share of revenues from corporate capital to be higher in the United States than in other OECD economies . . . . [However,] despite (or perhaps because of) its relatively higher corporate tax rates, the United States earns less federal revenue from corporate income as a percentage of GDP than the average OECD economy." Similarly, for a sample of nineteen OECD nations over the period 1965-2005, Edwards observed, "The average rate in the 19 countries fell from 45 percent in 1985 to 29 percent by 2005. During the same period, corporate tax revenue soared from 2.6 percent to 3.7 percent of GDP." Edwards noted that some of the revenue expansion in the late 1980s may have been because "many countries broadened their corporate tax bases [during that period] . . . often by reducing depreciation deductions." But he said that cannot explain the revenue increase in subsequent years when "most countries appear to not have broadened their corporate bases by much, if at all." A paper by Gravelle and Hungerford disputes some of the earlier studies. The authors claim to deduce from economic theory and empirical relationships that the revenue-maximizing corporate tax rate is at least 75 percent. Hence, they assert that any decrease in the corporate income tax rate must be a revenue loser. After modifying the estimation techniques in the Clausing study and the Brill and Hassett study, Gravelle and Hungerford claim to find no evidence in the international data that a lower corporate tax rate would boost corporate tax revenue. Instead, the data suggest to them "that the corporate tax rate has little effect on corporate tax revenues as a percentage of GDP." The Gravelle and Hungerford study is an extreme outlier compared to the others, but it unintentionally provides a powerful reason for cutting the corporate income tax rate. If the corporate rate has little impact on corporate revenues as a share of GDP, then the corporate rate can be reduced without significantly diminishing corporate tax revenues as a share of GDP. In that event, two benefits of lowering the corporate tax rate would be pushing up GDP and triggering a growth-led increase in revenues from other taxes. Chen and Mintz highlight the Canadian experience. Canada has staged a remarkable economic turnaround in the past fifteen years, with the improvement beginning when Liberal Prime Minister Jean Chrétien initiated deep spending cuts and some tax relief in response to a soaring national debt and a financial crisis. Chen and Mintz write,"[T]he combined federal-provincial [corporate income] tax rate fell from 42.4 percent in 2000 to 29.4 percent in 2010. Despite this 31 percent cut and the 2009 recession, tax revenues as a share of gross domestic product (GDP) have remained roughly constant due to rising corporate taxable income." In earlier work, Mintz had estimated that "the revenue-maximizing corporate income tax rate for Canada is 28 percent." Like the other researchers, he based his estimate only on corporate income tax collections, not on the positive growth feedback from a lower corporate rate leading to higher revenues from other taxes. A lower corporate income tax rate would be a tonic for the ailing U.S. economy that would accelerate growth by reducing tax biases against saving and investment. The pro-growth impact would be substantial because investment and the stock of capital are extremely sensitive to the expected after-tax rate of return. A larger, more vibrant economy would help people throughout the nation by generating higher real incomes, a greater supply of goods and services, and more opportunities. 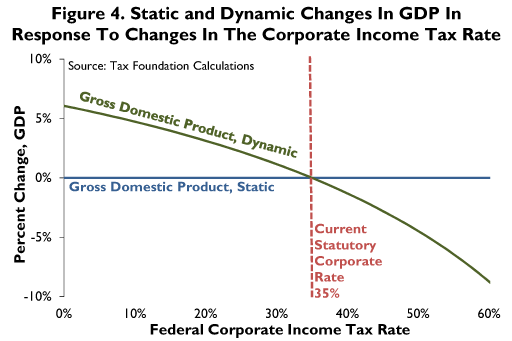 The revenue impact would be positive because a corporate tax rate cut of the magnitude often discussed in policy circles would generate a sufficient tax-base expansion to offset the lower tax rate, although revenues would fall for a few years until the upsurge in the capital stock lifted GDP enough to counterbalance the rate cut. Very few tax cuts pay for themselves, but this would be one that does. A lower corporate tax rate would probably be worthwhile due to the benefits from a larger, more prosperous economy even if federal revenues fell; the potential revenue gain is a bonus. An additional bonus is that a less lofty U.S. corporate tax rate would be an effective and relatively painless way to reduce the leakage of taxable corporate income out of the United States and into other nations. A barrier to moving to a more sensible corporate tax rate, though, is that conventional revenue estimates artificially assume tax changes never have growth effects. It is ironic that although a bigger economic pie is one of the chief motivations for wanting to cut the corporate income tax rate, official revenue estimates assume away the growth effect. If policymakers believe conventional revenue scoring, they will be badly misled because a tax policy that would, in fact, spur growth and raise revenue will appear, on paper, to be a revenue loser. An aim of the Tax Foundation model is to furnish policymakers with better information regarding the likely consequences of changing the corporate tax rate. If members of Congress feel compelled to compensate for the phantom revenue loss or for the initial, temporary decline, the best places to look would be low-value government spending programs or corporate welfare. Members should be careful to avoid changes in the tax base that would overstate true incomes or undo some of the benefits of the rate cut. A special concern, because it is frequently mentioned as a possibility, would be imposing a capital cost recovery system that would be dramatically slower than the present one. Philip Dittmer, U.S. Corporations Suffer High Effective Tax Rates by International Standards, Tax Foundation Special Report No. 195 (Sept. 13, 2011), https://taxfoundation.org/article/us-corporations-suffer-high-effective-tax-rates-international-standards. Åsa Johansson, Christopher Heady, Jens Arnold, Bert Brys, & Laura Vartia, Tax and Economic Growth, OECD Economics Department Working Paper No. 620, ECO/WKP(2008)28 (July 11, 2008), at 2, http://www.oecd.org/tax/taxpolicyanalysis/41000592.pdf. For a fuller discussion of the model's Cobb-Douglas production function, see Stephen J. Entin, Economic Consequences of the Tax Policies of the Kennedy and Johnson Administrations, IRET Policy Bulletin No. 99 (Sept. 6, 2011), at Appendix A, http://iret.org/pub/BLTN-99.PDF. The representative tax records are from the IRS's Public Use File. The IRS blurs the data prior to release to protect the privacy of actual taxpayers and prevent any specific individuals from being identified. In recent years, the Public Use File has contained roughly 130,000 to 150,000 representative tax records. The rate schedule is progressive, but most income is in the top bracket. The Organisation for Economic Co-operation and Development (OECD), OECD Tax Database, Basic (Non-Targeted) Corporate Income Tax Rates – Table II.1 (updated with 2012 data), http://www.oecd.org/ctp/taxpolicyanalysis/oecdtaxdatabase.htm#C_CorporateCaptial [sic]. Japan had formerly occupied the top spot, but it lowered its corporate rate effective April 1, 2012. A caution is that corporate income and, therefore, corporate profits taxes are extremely sensitive to the condition of the economy. They vary greatly from year to year, and so does their share of total federal revenues. The dollar amounts cited are for the particular base year, 2008, used in the model. They would be different if 2012 had been the model's base year, but the pattern would be the same. To translate the employment changes into full-time equivalent jobs (FTE), data on total hours worked was obtained from the Bureau of Labor Statistics (www.bls.gov). It was assumed that a full-time equivalent job equals 2,080 work hours. Some of the FTE changes might occur through existing employees working more or fewer hours than they do currently. A caution regarding the dollar amounts is that corporate income and, therefore, corporate profits taxes are extremely sensitive to the condition of the economy. They vary greatly from year to year, and so does their share of total federal revenues. The dollar amounts cited here and later are for the particular base year, 2008, used in the model, adjusted by subsequent inflation to express them in 2012 dollars. The pattern would be the same if 2012 had been the base year, but the specific numbers would be different. U.S. Bureau of Economic Analysis, National Income and Product Accounts, Table 3.2. Federal Government Current Receipts and Expenditures, http://www.bea.gov/iTable/index_nipa.cfm. Office of Management and Budget, Budget of the United States Government, Fiscal Year 2013, Historical Tables, Table 1.3, http://www.whitehouse.gov/sites/default/files/omb/budget/fy2013/assets/hist.pdf. Cato Institute, Tad DeHaven, Corporate Welfare in the Federal Budget, Policy Analysis No. 703 (July 25, 2012), http://www.cato.org/publications/policy-analysis/corporate-welfare-federal-budget. For a fuller explanation, see James R. Kee, Introductory Discussion of the Basic Concepts of Depreciation and Expensing, IRET Policy Bulletin No. 75 (Mar. 10, 1999), http://iret.org/pub/BLTN-75.PDF. Kimberly A. Clausing, Corporate Tax Revenues in OECD Countries, 14 International Tax and Public Finance 115-133 (Apr. 2007), at 130, http://www.perpustakaan.depkeu.go.id/FOLDERJURNAL/pendapatan%20pajak%20perusahaan%20OECD.pdf. Michael P. Devereux, Developments in the Taxation of Corporate Profit in the OECD Since 1965: Rates, Bases and Revenues, paper prepared for a conference of the Alliance for Competitive Taxation, June 2, 2006, revised December 2006, http://econpapers.repec.org/scripts/redir.pf?u=http%3A%2F%2Fwww.sbs.ox.ac.uk%2Fcentres%2Ftax%2FDocuments%2Fworking_papers%2FWP0704.pdf;h=repec:btx:wpaper:0704. Alex Brill & Kevin Hassett, Revenue-Maximizing Corporate Income Taxes: The Laffer Curve in OECD Countries, American Enterprise Institute Working Paper No. 137, July 31, 2007, http://www.aei.org/files/2007/07/31/20070731_Corplaffer7_31_07.pdf. Kevin Hassett & Aparna Mathur, Report Card on Effective Corporate Tax Rates: United States Gets an F, American Enterprise Institute Tax Policy Outlook No. 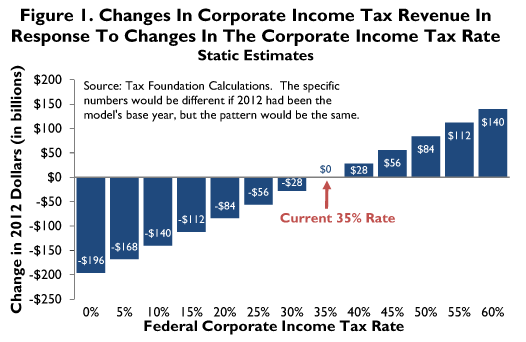 1 (Feb. 2011), at 5 (emphasis added), http://www.aei.org/article/economics/fiscal-policy/taxes/report-card-on-effective-corporate-tax-rates. Chris Edwards, Is the U.S. Corporate Tax in the Laffer Zone?, Tax Notes, Dec. 10, 2007, http://www.cato.org/sites/cato.org/files/articles/edwards-taxnotes-laffer-curve.pdf. Congressional Research Service, Jane G. Gravelle & Thomas L. Hungerford, Corporate Tax Reform: Issues for Congress, RL34229 (Dec. 16, 2011), http://taxprof.typepad.com/files/crs-rl34229.pdf. Duanjie Chen & Jack Mintz, Corporate Tax Competitiveness Rankings for 2012, Cato Institute Tax & Budget Bulletin No. 65 (Sept. 2012), http://www.cato.org/sites/cato.org/files/pubs/pdf/tbb_65.pdf. Jack M. Mintz, 2007 Tax Competitiveness Report: A Call for comprehensive Tax Reform, C.D. Howe Institute Commentary No. 254 (Sept. 2007), at 14, http://cdhowe.org/pdf/commentary_254.pdf.